MGM opens the doors of MGM COTAI in Macau today, showcasing MGM’s one-of-a-kind entertainment experiences for the first time. MGM COTAI is the latest integrated resort addition to the portfolios of MGM China Holdings Limited (HKSE: 2282) and the parent company MGM Resorts International (NYSE: MGM). MGM COTAI is a US$3.4 billion integrated resort which will redefine the way people experience art and entertainment through innovative technology, putting Macau center stage as a global travel destination and plays a pivotal role in Macau’s evolution as World Center of Tourism and Leisure. 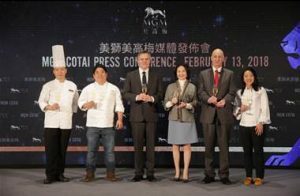 (From left) Chef Yang Dang Chuan, Chef Mitsuharu Tsumura, Mr. James J. Murren, Chairman & Chief Executive Officer of MGM Resorts International and Chairperson & Executive Director of MGM China Holdings Limited; Ms. Pansy Ho, Co-Chairperson and Executive Director of MGM China Holdings Limited; Mr. Grant Bowie, Chief Executive Officer and Executive Director of MGM China Holdings Limited. and Chef Janice Wong are toasting at MGM COTAI Grand Opening press conference. Mr. James J. Murren, Chairman & Chief Executive Officer of MGM Resorts International and Chairperson & Executive Director of MGM China Holdings Limited; Ms. Pansy Ho, Co-Chairperson and Executive Director of MGM China Holdings Limited; and Mr. Grant Bowie, Chief Executive Officer and Executive Director of MGM China Holdings Limited, attended today’s Grand Opening press conference. “We set out with a vision to develop an integrated resort that brings first of its kind experiences to Macau and beyond. I am incredibly proud of the talented global team of MGM professionals for bringing this vision to life with the opening of MGM COTAI,” said Mr. James J. Murren. “MGM is committed to supporting the development of Macau as a global tourism destination and I am grateful to the Macau government for allowing us the opportunity to invest and develop a second property here,” Murren added. As Macau’s most innovative integrated resort and the new must-see destination in Macau, MGM COTAI empowers guests to create their own memorable moments through offering never-been-seen-before entertainment experiences. One of the key highlights of the resort is the MGM Theater at COTAI, Asia’s first dynamic theater that can transform into over 10 different configurations with the press of a button. This versatile venue can accommodate up to 2,000 guests and is the world’s first theater to offer 28 million pixel of viewing pleasure to its audience by utilizing a giant 900-square-metre 4K (or ultra HD) LED screen, which is the size of three tennis courts combined. The MGM Theater at COTAI will offer three regular resident shows, with the first show Destiny to be launched soon. Located at the heart of the resort, Spectacle is the epicenter of entertainment at MGM COTAI. Providing an immersive, multi-dimensional sensory experience to guests, Spectacle is a meticulously engineered column-free long-span diagrid structure, which will seem to be alive, continually evolving and responding to changing conditions such as visitor behaviors, weather, time of day or season. Spectacle comprises the world’s largest area of permanent indoor LED screens, which showcases an exclusive array of digital art collected from around the globe.Complementing the technology is the world’s largest indoor art garden, dubbed Nature’s Art. Spectacle will house more than 100,000 plants and over 2,000 plant species including more than 200 different orchid species, many of which are native to Macau and Hong Kong. MGM COTAI is also bringing some of the world’s most innovative culinary adventure to Macau. The resort offers never-before-seen-in-Macau dining concepts led by four globally acclaimed chefs – Mauro Colagreco, Mitsuharu Tsumura, Graham Elliot and Janice Wong. Together with four other restaurants offering authentic Chinese cuisines from different regions and a bar serving crafted cocktails, a total of nine food and beverage outlets at MGM COTAI will take everyone on an unprecedented gastronomic journey. Guests can also enrich their travels with over 300 pieces of captivating and thought-provoking artwork from the MGM COTAI Art Collection which will be on display throughout the resort. This includes 28 Chinese imperial carpets dating from the Qing Dynasty, modern and contemporary Asian paintings and sculptures by renowned artists, freshly-commissioned works by local and regional rising talents, and large-scale installations. In keeping with MGM’s reputation for best in class facilities, the 1,390 guest rooms manifest a serene setting by blending sophisticated elegance and modern luxuries, with comfortable and functional design. Staying true to its ethos of making great moments at MGM, guests can relax and indulge at MGM COTAI with its unparalleled services. MGM COTAI also has 2,870-square meter of versatile meeting space, making it ideal for a wide variety of events, from small private gatherings to product launches, high impact presentations, award ceremonies and concerts. The meeting spaces utilize MGM COTAI’s professional hospitality experience and innovative technology to deliver customized experiences for individual and corporate guests.